Why Isn’t AltaLink Fined for Killing Birds? | R.E.T.A. Doug Smith of Sherwood Park rightly points out in this letter to the Edmonton Journal that tar sands companies are “whipping posts” when it comes to bird deaths in their tailings ponds, whereas AltaLink gets away with killing hundreds of birds and continues to be allowed to build massive overhead transmission lines in areas of high bird concentrations. 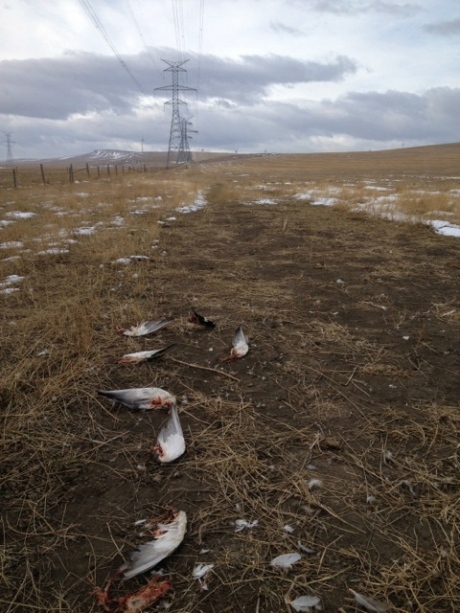 This year and last year, one of AltaLink’s new overhead high voltage power lines built near Pincher Creek killed hundreds of birds. AltaLink had been warned before the line was built in an area of high bird concentration and movement, that this might happen; however, they went ahead and built the line above ground anyway. Syncrude was justifiably fined $3.2 million in 2010 for killing at least 1,600 waterfowl in their Fort McMurray tar sands tailings ponds in 2008. Based on the known death toll to date of birds killed by the recently-built Pincher Creek high voltage power line (445 birds), AltaLink is clearly in violation of, at least, the federal Migratory Birds Convention Act, which prohibits the killing or destroying of migratory bird species. Waterfowl, such as those killed by AltaLink, are migratory bird species. But why has AltaLink not been charged? Overhead electricity transmission and distribution lines are known to kill tens of millions of birds annually in North America. The U.S. Fish and Wildlife Service estimates that about 174 million birds are killed annually from collisions with overhead power lines and towers in the U.S. alone. Isn’t it time that transmission companies be held accountable for this annual slaughter? High voltage transmission lines should be buried like all of our other utilities. Underground power lines do not kill birds. See this link for the many benefits of burying power lines. ~ by RETA on November 24, 2014.